Should I Still Eat Sunflower Seeds When Trying to Lose Weight? Celery is widely known as a dieter's tool for weight loss. It's so low in calories that celery is certainly a smart choice for a diet-friendly food that can help you lose weight. But you could eat lots of celery and never lose any weight if it's not part of a calorie-controlled diet. Regular exercise and getting the nutrients your body needs through a balanced diet are still significant factors in any weight loss plan. Celery is a versatile vegetable. Together with carrots and onions, celery forms the foundational flavor in soups and casseroles. Its crunchy texture makes it a desired addition to salads. When you're dieting, munching on a plain celery stick helps drive away hunger. And when it's stuffed with a healthy nut butter or fat-free cream cheese, celery is elevated into a nutritious and satisfying snack that helps you avoid high-calorie, diet-sabotaging snacks, such as chips and chocolate bars. Like most vegetables, celery is a grab-and-go snack that is easy to pack in your purse or lunchbag -- one that needs no heating or refrigeration. A single, large stalk of celery contains a mere 10 calories. When you're watching calories, it's important to pack as many nutrients as possible into the foods you eat. Celery can help with that goal too. One stalk supplies 20 percent of your recommended daily allowance of vitamin K, 12 percent of vitamin A and 4 to 6 percent of folate, vitamin B-6 and potassium. As you would expect, it contains barely a trace of fat and only has 2 grams of total carbohydrates. Negative calorie foods are thought to require more energy to consume and digest than they add in calories, thus creating a calorie deficit. However, studies have never proven this claim, notes a report by Natalie Muth, MD, MPH, RD published by ACE, or the American Council on Exercise. 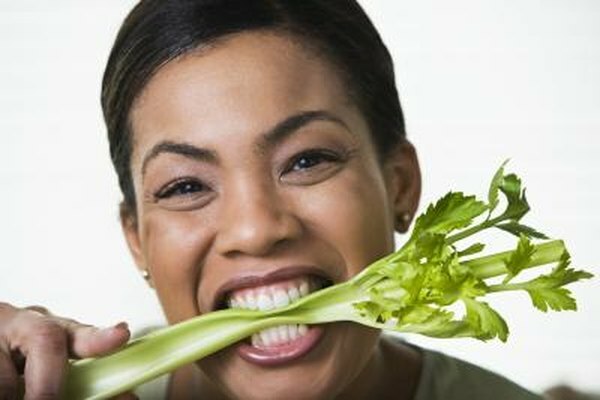 So celery may not be a negative calorie food, but it still helps you lose weight by virtue of being a low-energy dense food. Energy density is the number of calories per gram of food. Thanks to water and fiber, which add bulk without calories, celery has very few calories in a reasonable serving. This lets you eat more and get full without consuming a bunch of calories. Although celery is a nutritious food for most, some parts of the vegetable are potentially dangerous to pregnant women, such as celery seeds or seed extract, which may stimulate contractions or bleeding and cause a miscarriage. Additionally, celery might cause food allergies in some people, which may lead to dangerous immune-system reactions such as anaphylactic shock. Talk to your doctor about using celery as a weight loss tool. ACE: Do Negative Calorie Foods Really Exist?